Do I have the Time, Money & the Personality to own a German Shepherd Dog? TIME - will you make time to socialise, train, play with, exercise, groom, shop for, feed, read about and clean up after your dog? MONEY - can you afford to carry out your responsibilities to feed, train, house and care for the dog, give it veterinary attention, put it in boarding kennels, pay for registration, buy necessary equipment etc.? PERSONALITY - think honestly about your personality - are you fearful and nervous; do you tend to be a show-off; are you a bully; are you patient; are you prepared to tolerate a certain amount of destructiveness, and put up with the frustrating and irritating behaviour of a normal puppy? This behaviour should be properly managed, so that the dog is not ruined by inappropriate punishment, nor, at the other extreme, allowed to develop bad habits as it grows up. A checklist of points to consider if you want to be a responsible dog owner. Socialise your puppy to get along with people and other dogs. Learn how to handle your dog in a confident, relaxed manner when it meets other dogs, to minimise aggression. If you have children, supervise them when they are with your dog, especially when they have friends over. Keep your dog within your property. Make sure you have good fences and keep your dog in at night. Don’t let your dog charge at people going past. Provide your dog with adequate shade and shelter. Always have fresh water available for your dog. If you have a puppy, provide water in a container that cannot be tipped over. Do not leave your dog unattended in a car on a warm day. Wind the windows down far enough to provide ventilation, and check your dog every fifteen minutes. Unless you are a breeder or have a top show dog, have your dog de-sexed. Take your dog to the vet for an annual checkup and vaccination. Annual Vaccinations - Are they necessary? Don’t let your dog jump up on people. Don’t let your dog lunge or rush at people when you are out walking. Don’t let your dog lunge or rush at other dogs when you are out walking. Don’t let your dog use the footpath, playground or other public areas as a toilet. Register your dog with the local council. Put a collar on your dog with its registration tag and your name, address and phone number. Consider having a silicon chip implanted in your dog for identification. Have your dog on a lead (we recommend Black Dog Collars & Leads) when you are walking in the street. There are some public places such as parks where you can exercise your dog off lead, but the dog must beunder effective control. This means it will not attack or annoy people or other dogs, and it will come when called - reliably. There are training programs available to teach this. Call your dog to heel when going past a playground, or when joggers, cyclists or walkers go by. Never encourage your dog to attack dogs, chase cats or other animals. Teach your dog to ride quietly in the car, without leaping around. Dog harnesses are available if you want to restrain your dog for added safety. Teach your dog not to jump out of the car until asked. 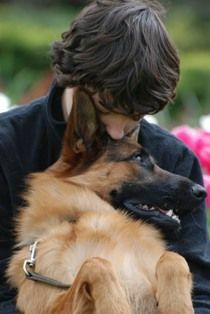 If you have bought a dog for personal or family protection, you must aim for a very high standard of obedience training. You should also socialise your dog to be friendly and confident with non-threatening people. Being a responsible pet owner means you always clean up the "doggy doo". DEPI article on Doggy Doo. Being a responsible pet owner means that you dog is confined safely & securely on your property.